Food Wishes Video Recipes: Chocolate, Egg, and Cream? Fuggeddaboutit! Chocolate, Egg, and Cream? Fuggeddaboutit! 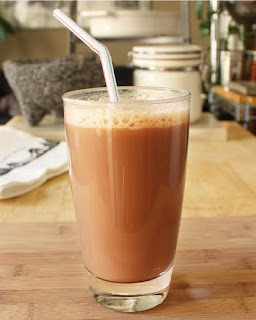 This chocolate egg cream video was inspired by our recent trip to New York City, where my wife Michele and I enjoyed them on several occasions. As I watched the expression on her face while she sipped this unique treat, I knew I had to film a quick how-to as soon as we returned. Contrary to the name of this New York City soda fountain classic, chocolate egg creams do not contain any eggs or cream. 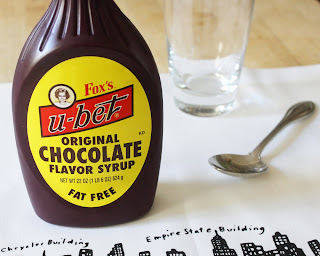 What is does contain is Fox's "U-bet" chocolate "flavor" syrup. This uniquely American ingredient hails from Brooklyn, New York, and despite the picture of the woman on the label (why is she looking at me like that? ), I love the flavor of this syrup. If you can't find it, I'm sure a certain brand from Pennsylvania will do just fine. Along with the chocolate come the simple additions of milk and seltzer water. The magic of this drink is how the minimalist design produces such a rich, yet refreshing chocolate beverage. In fact, one of the reasons the beverage was so popular in its time, it was considered a cure for indigestion! There are all sorts of arguments about the origins of this drink (when it comes to sports and food, New Yorkers do seem to enjoy a good debate), but most chocolate soda fountain drink historians think this was invented somewhere in Brooklyn, in the 1920's. The technique is very simple, and as I suggest in the video, you'll want to adjust the trio of ingredients to the ratio that you find most satisfying. Some prefer this very light and frosty with extra milk, others go for the darker, flatter and richer. Cool, now I know what an egg cream is. I never had any idea what it was. Easy and sounds refreshing. Thanks Chef. Good piece! I have some very passionate ideas about egg creams. First, saying "chocolate egg cream" is like saying "cucumber pickle." It's an egg cream, not a chocolate egg cream. When someone comes along and creates other flavors--sacriledge--those might be "vanilla egg creams" or whatever, but the genuine article is just "egg cream." Seltzer is carbonated water. Club soda is the same thing with salt added. You definitely wouldn't want club soda in an egg cream if you had your choice. While the end product is pretty much the same, much like the throwing of a pizza, there is an art to the making of the egg cream. The "pros" seem to bounce the spoon in an almost up and down motion as the seltzer is added, producing a rhythmic sound as the spoon keeps contacting the glass. The pouring tends to be continuous, with a topping off sometimes needed. Finally, I was taught that using VERY cold milk is important. I've tried it several ways, and I tend to agree with this. In fact, I used to put a carton in the freezer for a little while before making egg creams. I would tell people to use "partially frozen" milk when offering the recipe. Anyway, I just wanted to throw in my two cents not to criticize but to celebrate. And you have a WONDERFUL blog I enjoy following. I've wanted to try this since I read Harriet the Spy when I was a kid, but I can't wrap my head around chocolate-flavoured water! Thanks! Hey, I'm from upstate!! That was a nice video. This one looks so easy and very refreshing. I think chocolate should only be mixed with milk - it's like making a cheese sauce with water - YUK! But, each to their own. how timely! a girl friend is coming to visit - i'll ask her to pack one of those chocolate syrup for me. will be sure to try that one. My dad still makes these like he did when he was a soda jerk at his grandpa's soda fountain. If you use the ISI soda siphon you get a more authentic drink too (they're more akin to old time seltzer bottles than anything you buy and pour) From what I've been told it has something to do with the amount of pressure the gas is under. I have a strong feeling of deja vu today. What are you up to Chef John? Paul D. - Haha, sorry Chef John... nothing personal. I thought you were from San Fransisco, but then again you strike me as an east coast guy. I stand corrected. I suppose they know how to make egg creams upstate too, but they still can't say "fuggedaboutit" quite right. As far as the "chocolate egg cream" debate goes. In 30 years I have never heard a passionate debate regarding the flavors. Calling it "chocolate" is A-OK in every luncheonette and diner I have ever been too. When I worked in a ice-cream parlor we had to make these at times. The client was very particular about how the foam looked. It would be thick and like you said egg white like. I live in Chico,ca where do I get fox syrup? I've had a really good flat dark version made with Godiva or some other chocolate liquor. While you're in N.Y. or Pa., for historical purposes, try a Yoo-Hoo and let us know how it compares. It was invented in N.J. about the time the egg cream went eggless. There may be room for a little culinary intrigue here. Maybe all these things started in Jersey. I'll bet you find it to be kind of a bottled version of the chocolate egg cream. Pour it into a glass and put a little whipped cream on top to make your straw stand up. I prefer your method. I never cared for Yoo-Hoo...too thin. You know what else is good to do with this, especially w/ kids? Make this and then in a different glass add the choc. syrup - about 1/2 in. to the bottom and then slowly add the "soda" in that glass. You can see the two seperately and the syrup at the bottom is an extra treat. They can stir it up too, if they like. More chocolate is never bad. Can I substitute the soda water with sprite? Thanks for answering! Can I use sparkling water instead of seltzer? I grew up on Long Island (or LawnGuyLan) and we always had a pretzel rod in the glass with the straw. I made this tonight with a bowl of popcorn since I am conditioned to have the salty with the sweet. Hello from Little Rock – I'm So Busy It's Scary! Hello from Fugly Los Angeles!